Gilded hush puppies on a bed of popped sorgham at the new Protege in Palo Alto. 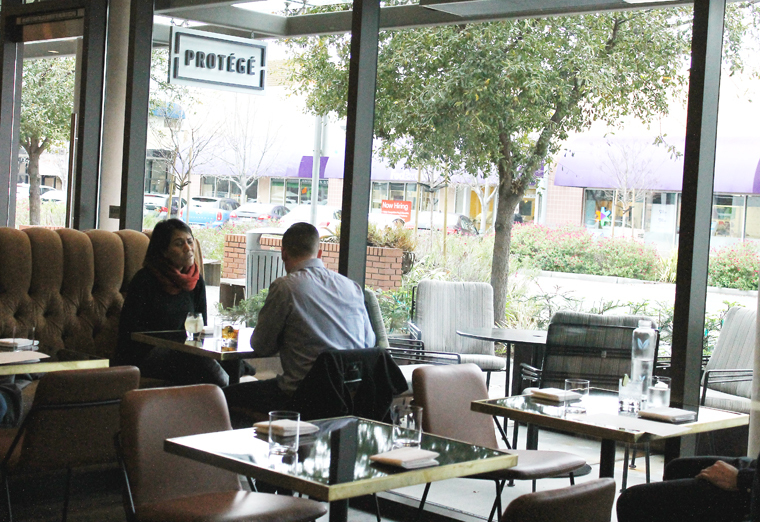 After more than a year of permitting and construction delays, Protege, arguably the most highly anticipated restaurant around, finally opened its doors to the public on Tuesday. Passersby have been peeking in the windows for months, streaking them with hand prints and even nose prints, so eager to experience this restaurant by French Laundry alums, Executive Chef Anthony Secviar and Master Sommelier Dennis Kelly. 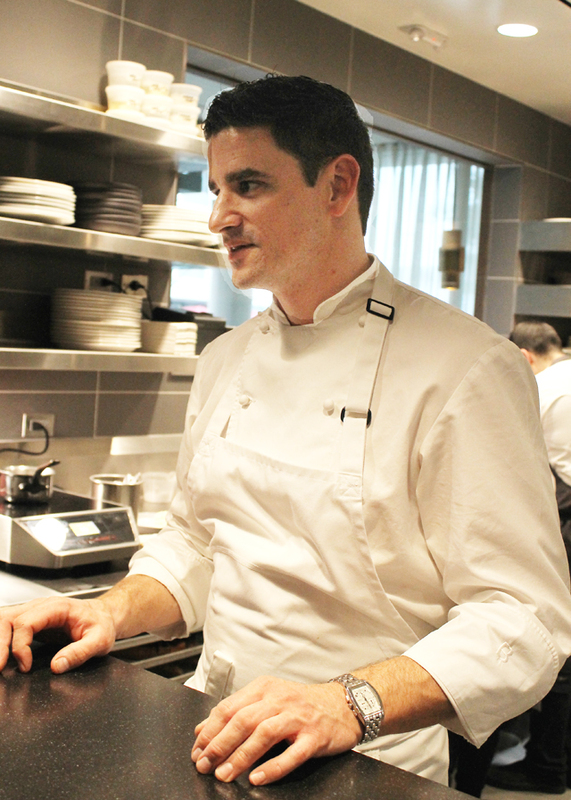 They are joined by Pastry Chef Eddie Lopez, who also hails from the French Laundry, as well as Grace in Chicago and Vintage Cave in Honolulu. With that kind of culinary star-wattage, is it any wonder that the night this California Avenue restaurant quietly debuted, there were already half a dozen people anxiously waiting outside half an hour beforehand to be one of the very first inside? 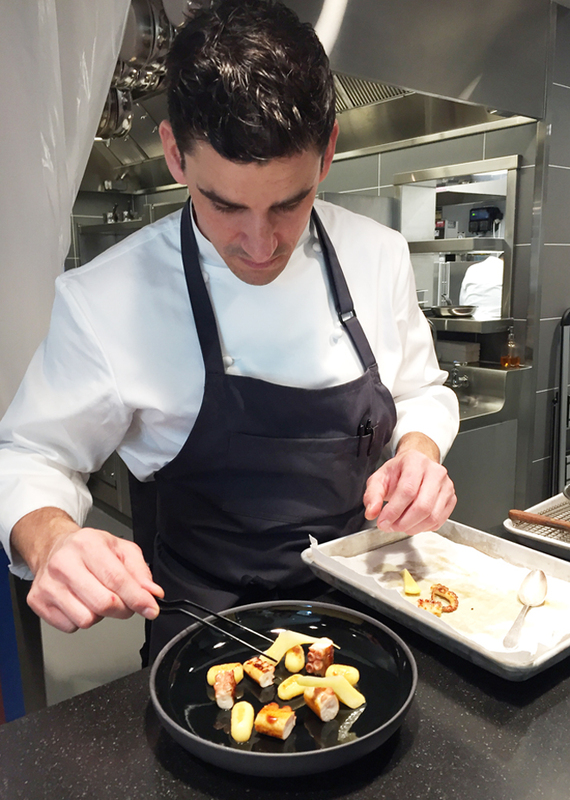 Head Chef Anthony Secviar readying a dish a few weeks before the grand opening. 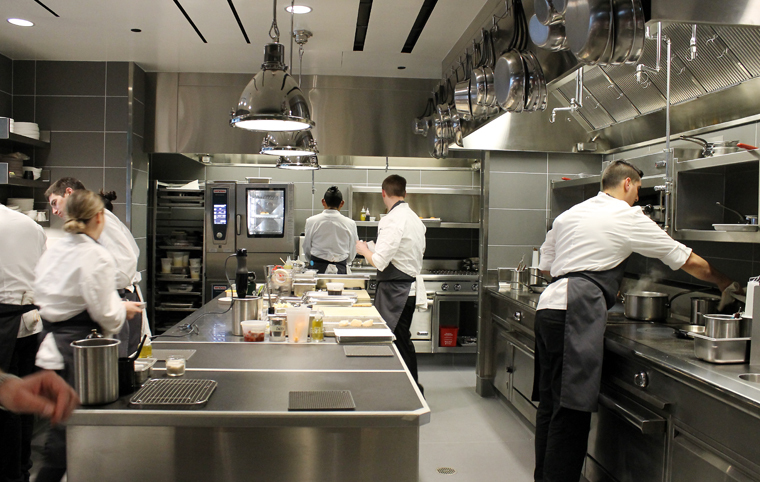 The kitchen on opening night. 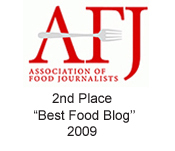 I was one of them, along with two friends, snagging seats at the chic, back-lighted bar, and paying our tab at the end. There are purse hooks underneath, of course, along with some of the most comfy nappa leather bar stools I’ve ever sat in. On Tuesday night, only the bar-lounge area was open. 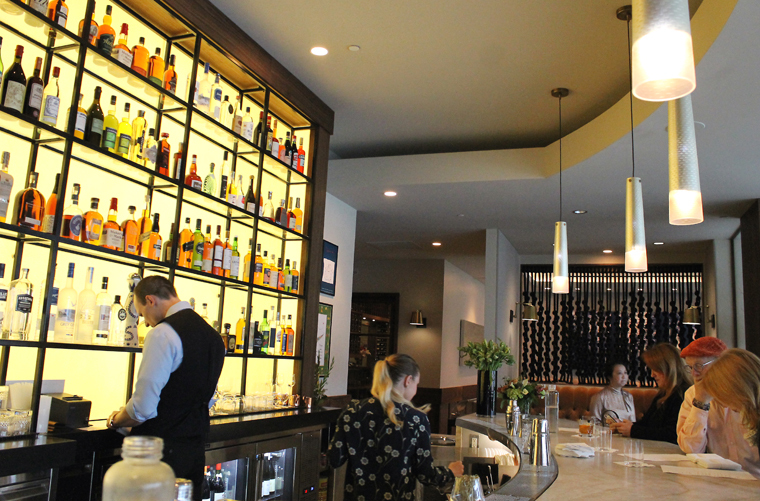 The more formal, prix fixe menu-only dining room will open this weekend. If you’re longing to grab a reservation, you might have to wait a while longer, as we were told all those reservations are already sold out. The lounge area is walk-in-only. 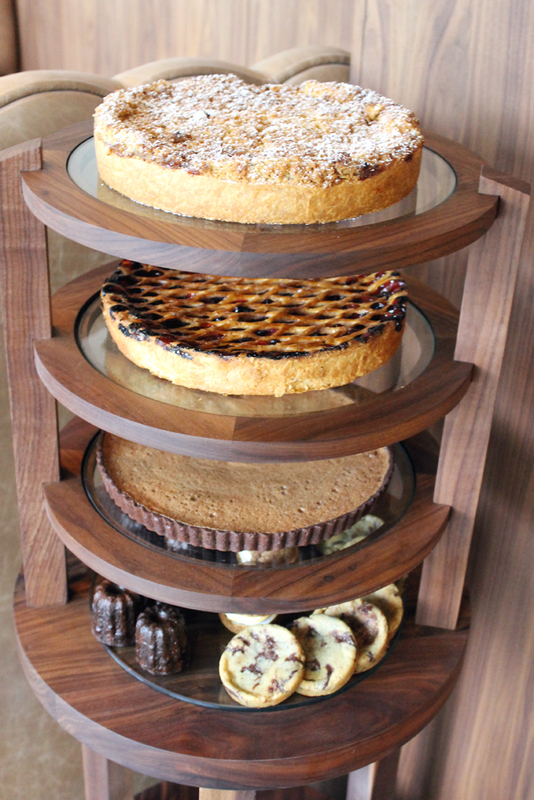 The lounge menu is divided into snacks, appetizers, entrees and desserts. It may be a lounge, but from the get-go, you can sense the finesse that goes into everything. Some of the first diners at the new restaurant. 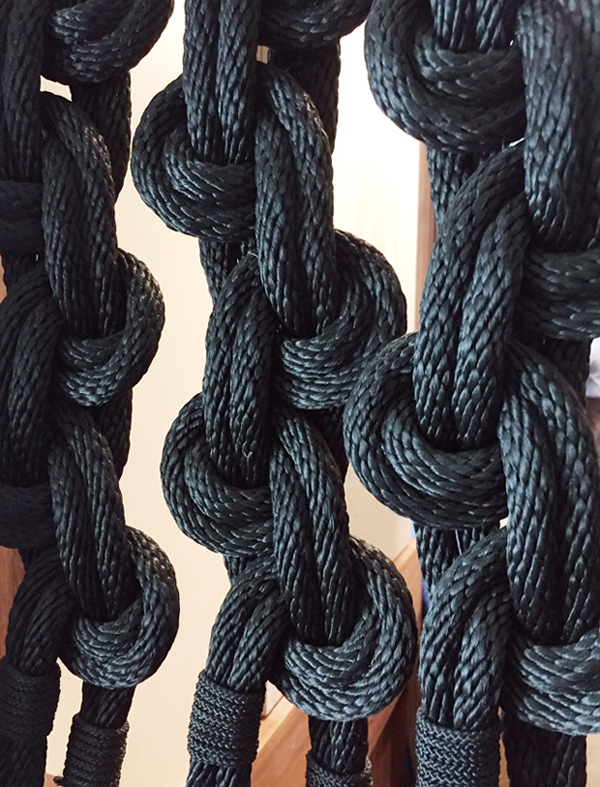 Close-up look at the macrame partition by San Francisco textile fine artist and former Apple product manager, Windy Chien. A specially built wine cellar holds 250 selections. Since it’s presided over by a Master Sommelier, you definitely want to give it a peruse, not to mention a taste. I can’t say I’ve necessarily ever been blown away by hush puppies in the past. But these ($8) are unlike any I’ve had before. 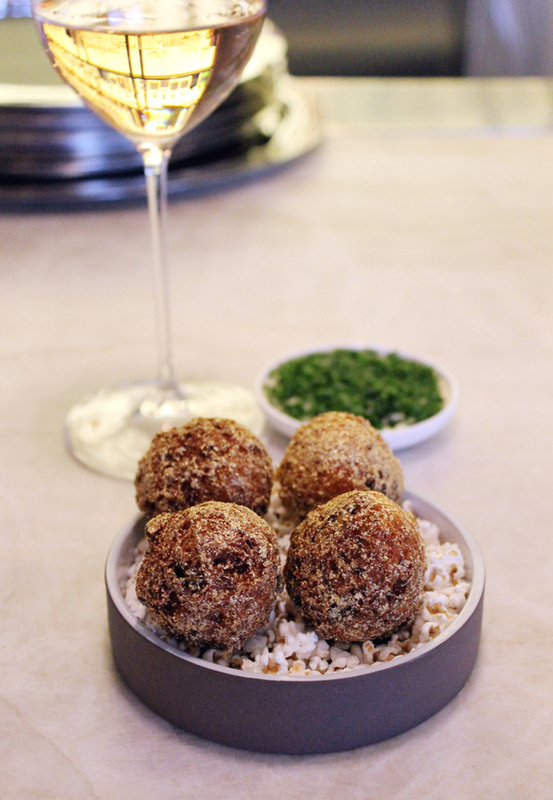 Spherical, flavored with ham hock and white cheddar, they arrive not only deeply golden but accentuated by gold leaf dust for extra sparkle. They are propped on a bed of what looks like lilliputian popcorn kernels, but are really popped sorgham, which you can eat, too. Dip the hushpuppies into sour cream and they are like 24-karat nuggets of joy — cheesy, and full of porky and corn goodness. 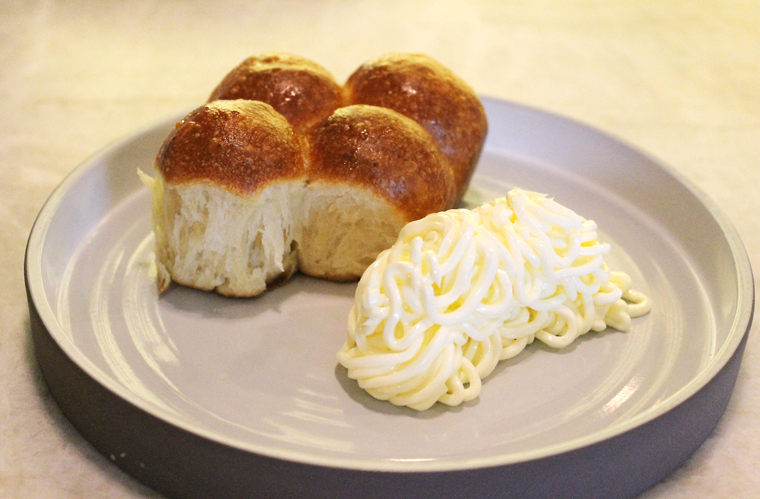 Petite Parker House rolls ($5) are made extra indulgent by being baked with browned butter. They are warm, right out of the oven on arrival, and served with a Play-Dough Pumper-like wad of extruded sea salted butter that resembles a tangle of noodles. A salad of Little Gems in buttermilk dressing. 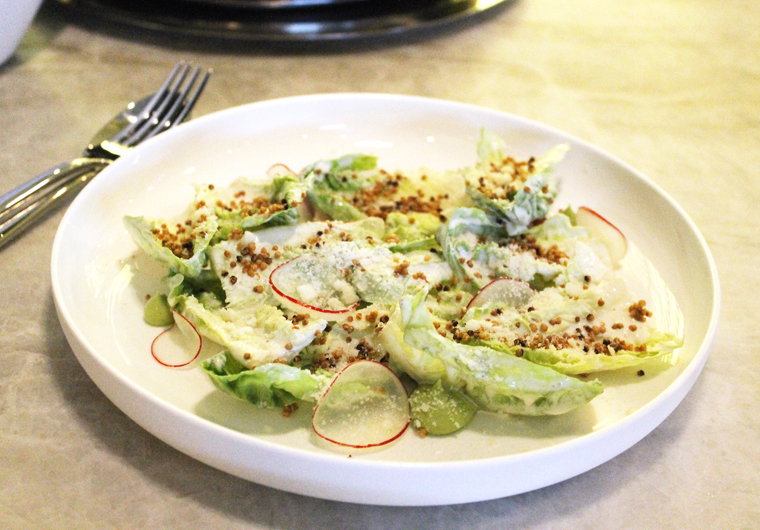 Little Gem Lettuce ($12) is a fresh, straight-forward salad with the gentle leaves tossed with buttermilk dressing and arranged just so with avocado, radish and crunchy puffed quinoa. 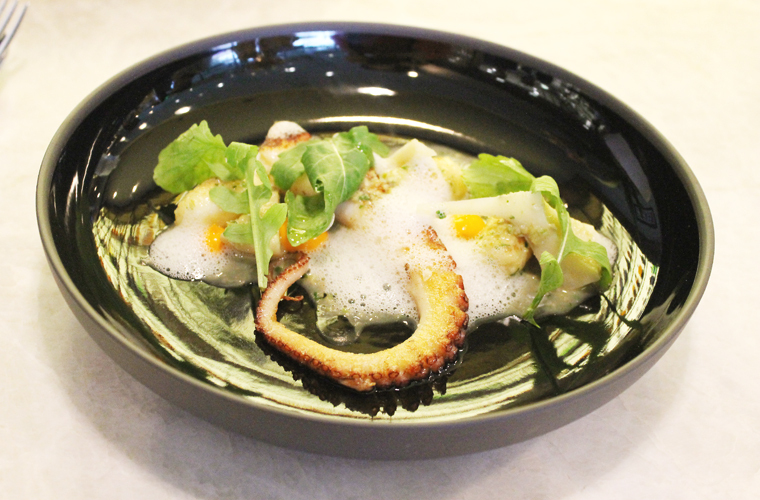 Spanish Octopus A La Plancha ($18) brings a tender tentacle garnished with creamy orange-red romesco sauce, baby artichokes, and potato gnocchi. Ricotta dumplings to swoon over. 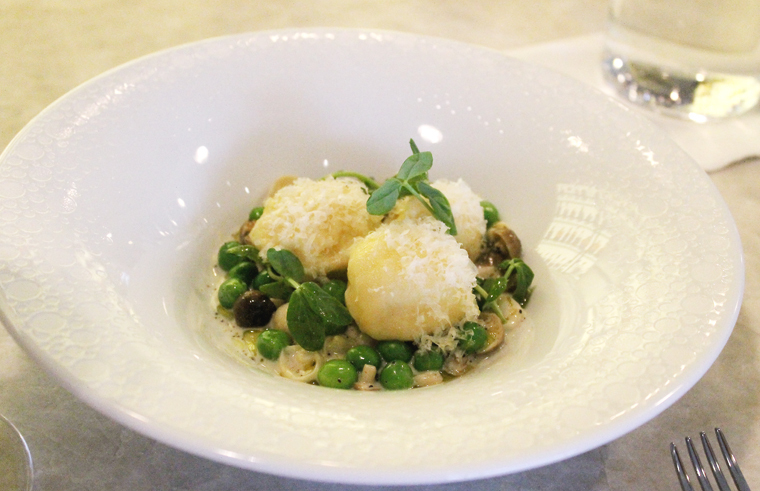 Ricotta Dumplings ($19) are to die for. The fluffy dumplings are intense with sharp, nutty Parmesan and have a hidden center of creamy ricotta. English peas and Beech mushrooms finish the dish, as does a little bit of black truffle. This is the epitome of spring in the woods in every sumptuous bite. 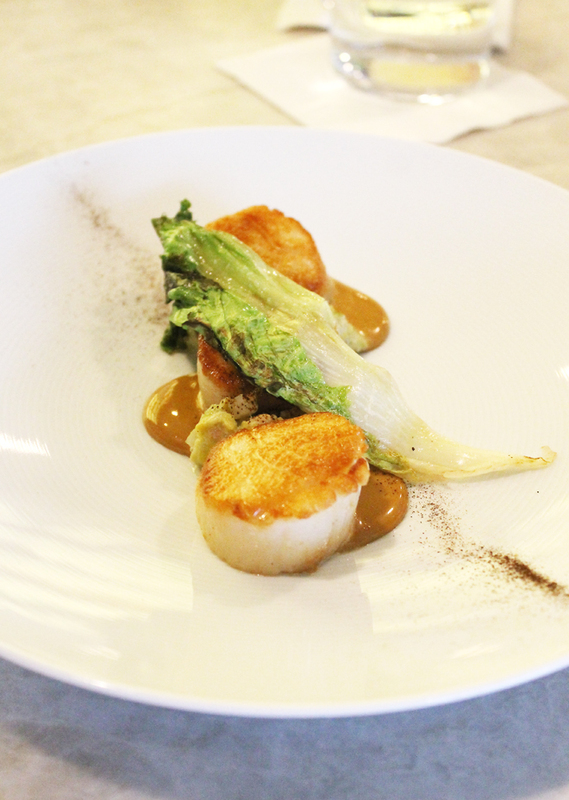 Sea Scallops ($32) couldn’t be any plumper, with a perfect sear to boot. Leeks are charred and meltingly sweet, and braised bacon adds just a touch of richness. A trio of sea scallops. 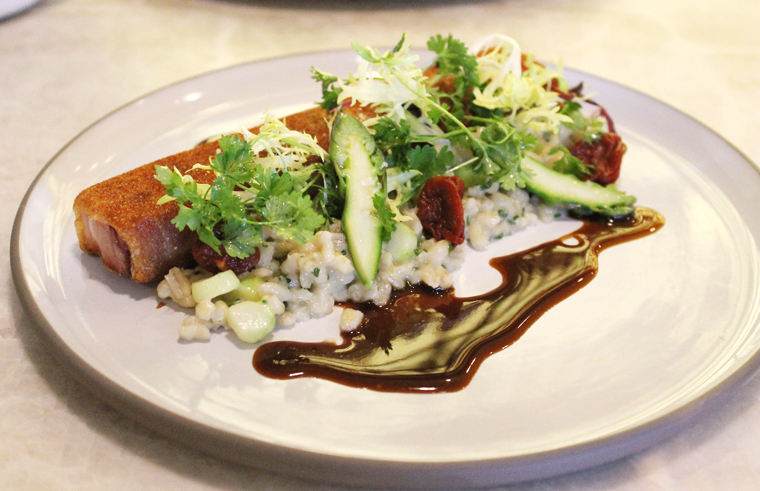 Crispy Pork Belly ($26) is shaped into a neat little brick-shaped package. It’s as indulgent tasting as expected, but a tangle of asparagus, toasted barley and teeny cherry-size confit tomatoes add delicious relief from the richness. A surprise package of pork belly. 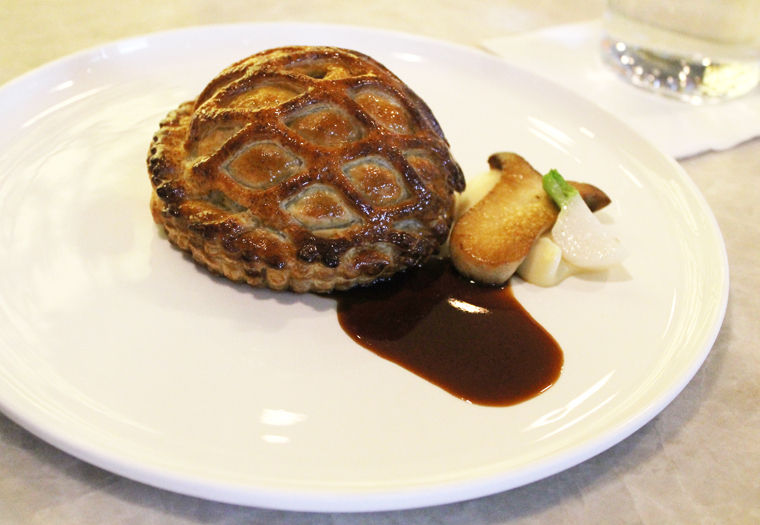 Short Rib Pithivier ($30) is sure to become a social media star. 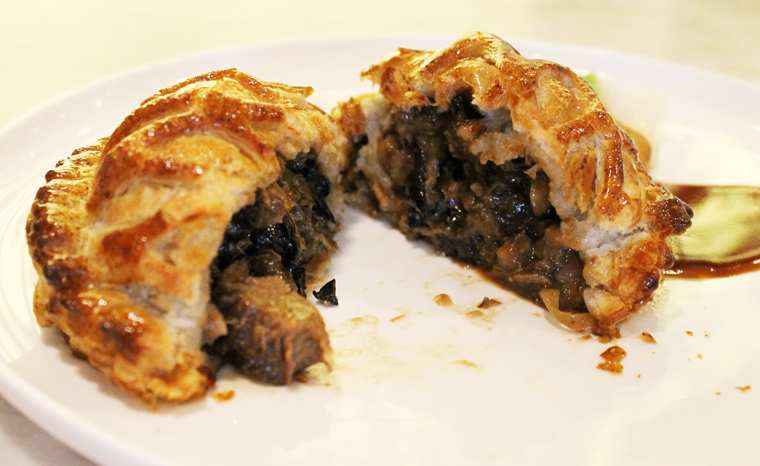 It’s like the fanciest looking British meat pie you’ve ever laid eyes on. It’s stuffed with chunks of tender short rib in a reduced red wine sauce. A slice of King Trumpet mushroom and halved sweet Tokyo turnips complete the dish. I need one of these parked in my house. OK, we did try just about every dessert offered. It was research, right? Any of the tarts or pies can be enjoyed a la mode, too. Lopez churns a selection of ice creams and sorbets daily. That includes his own version of Ben & Jerry’s Chunky Monkey. I didn’t think it was possible to improve on the original, but he has. 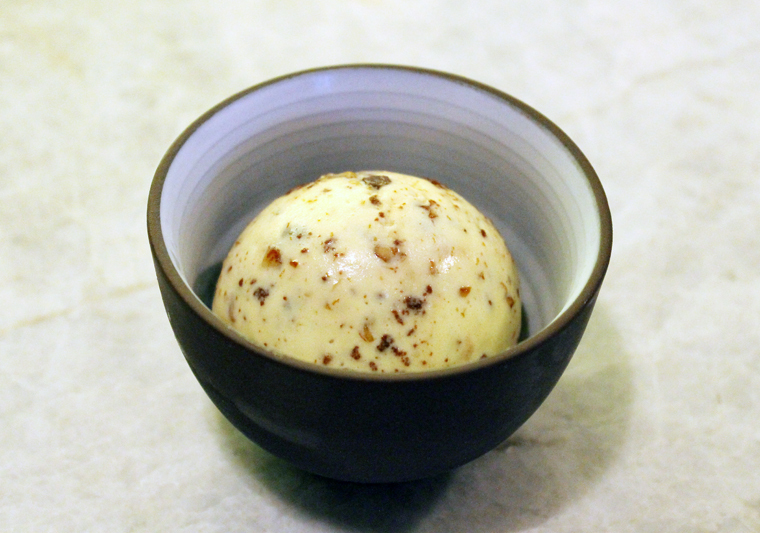 There is a purity of flavor to this mashup of banana ice cream, chocolate brownie bits and plenty of toasted walnuts. 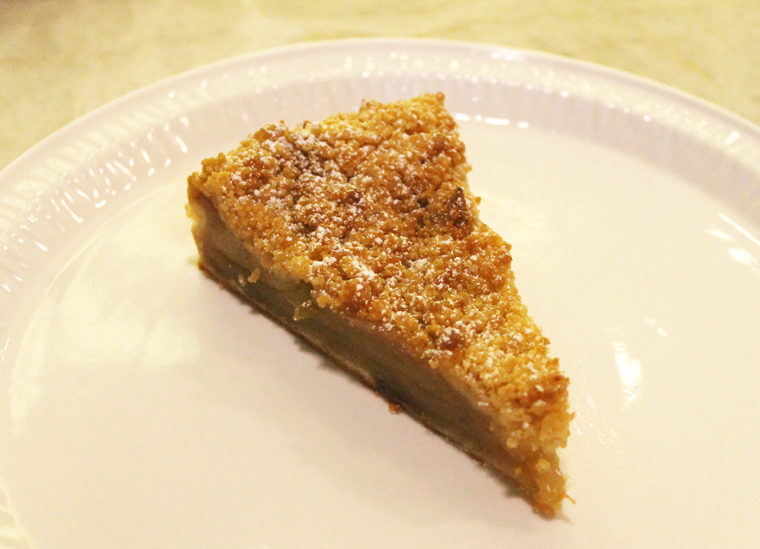 Grandma’s apple pie definitely boasts a more precise look than any a real grandma probably ever has made. Streusel covers a filling of apples that are compacted so that there are no air spaces whatsoever. 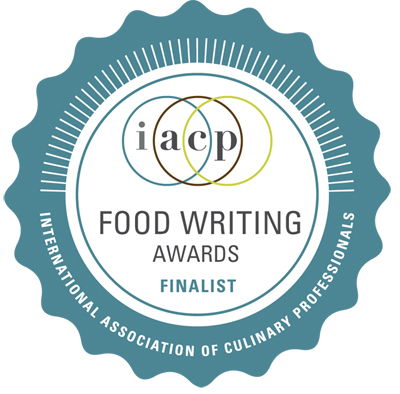 The result is unadulterated, full-on apple flavor. 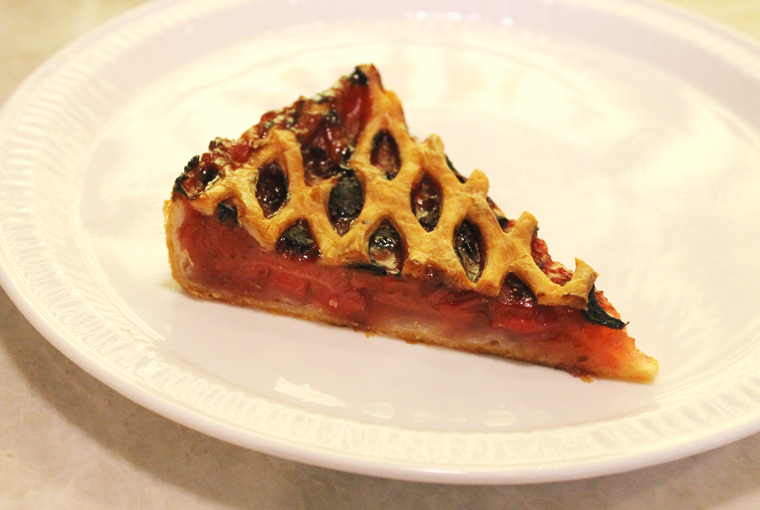 The strawberry-rhubarb latticed tart is bright with fruit flavor, sweet yet also tangy, with a refreshing restraint of sugar so that nothing ends up masked. 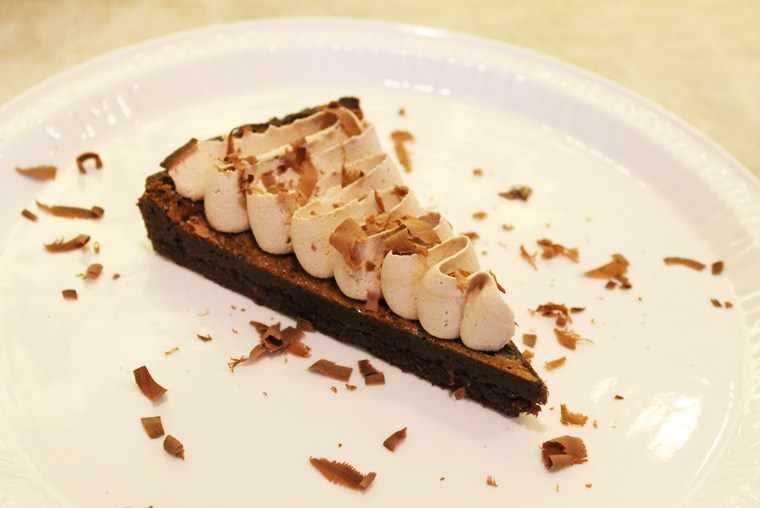 The chocolate tart looks plain on the cart, but gets a flourish of chocolate cream swirls once it’s plated. It’s a gluten-free dessert with a sour cherry puree that gives a lift to all that chocolate. The vanilla bean caneles are marvels with sturdy, burnished exteriors and the most custardy interiors ever. The chocolate chip cookie is a more dignified version. It doesn’t have the crisp, craggy edges on the outside. Instead, it’s perfectly round with a soft texture throughout. 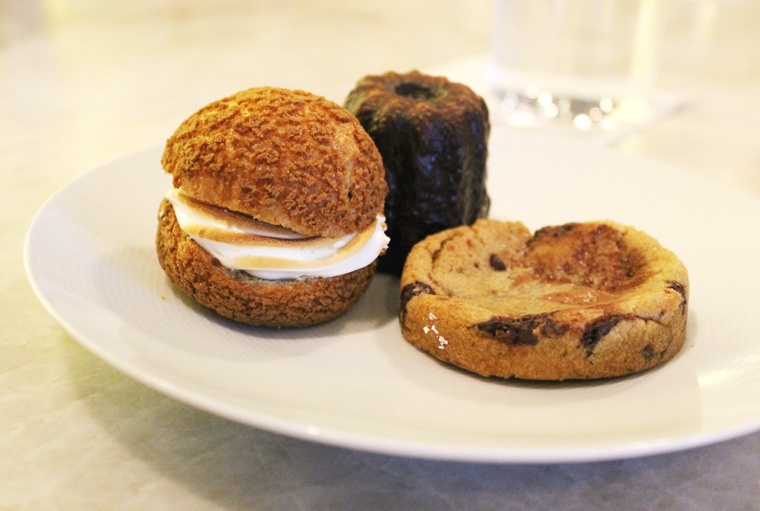 Banana-cream cream puff, chocolate chip cookie and canale. One of my favorites was the banana-cream cream puff. It tastes like a banana cream pie — but only better. The choux exterior is delicately crisp and the interior ever so airy, giving way to a torched meringue-like banana cream filling. I don’t know if it’s magic, but this dessert somehow eats as if it’s lighter than air. When’s the last time a cream puff was this ethereal? Chef Anthony greeting diners on opening night. The pie and tart slices do come on surprisingly rather large plates, causing them to slip and slide around a little bit. They sometimes look a little forlorn, too, with so much excess empty space. Maybe it’s a subliminal signal to enjoy seconds? 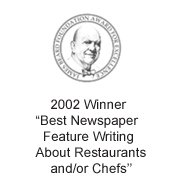 If so, I will easily say “yes” to that — and to making return visits to Protege to experience more at this exciting new player on the Bay Area food scene. Wow, everything looks amazing. I’m drooling of that pork belly. What a unique presentation. *All* the food looks amazing, but that pithivier! Positively drool-inducing. Can’t wait to get in there and try it.